Salzman’s figurative works speak to troubling issues, yet on the same canvas he manages to convey the hopeful with the grim. To do so, he borrows a composition technique from artists of the Gothic period: “They have a character doing different things in the same painting, violating the linear process — I find that very useful,” he explains. Case in point: In Salzman’s painting “Prometheus Bound/Unbound,” the central figure — painted as Barack Obama — appears twice, both as a “savior” delivering light and in his perpetual punishment. 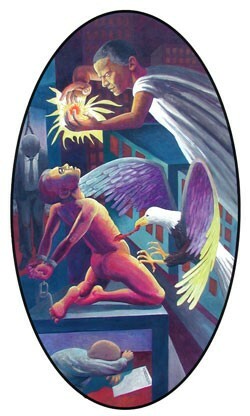 In the myth, Prometheus steals fire from Zeus out of compassion for mortals, who are living in cold and darkness. But Zeus, super-pissed, captures him and binds him to a rock. Every day, an eagle tears out his liver, which renews itself so the terrible torture can be repeated in perpetuity. Oh, and in this case, the bird is a bald eagle — avian symbol of America. Yeesh. Salzman’s background details are ripped from headlines, not mythology: a hanged man who might be any of the greedy, failed financiers offing themselves these days; a devastated man slumped over his foreclosure notice.